I’m excited to make this one! It’s not a traditional pizza. Have you made it? What do we need to know? This entry was posted in BWJ, P&Q. Bookmark the permalink. I’m in the same boat. My food processor is small. I usually always use a pastry blender (Its a really nice Pampered Chef one) and the dough turns out fine. In my opinion, the food processor just makes it easier and quicker. I’ve always had luck making pastry dough in my KitchenAid with the wire whisk attachment. Chill the bowl, flour and cubed butter together and then just let it run until you have “flakes”. Add the beaten eggs and it should come together fairly well with a bit of hand-kneading at the end. I’ve used both pastry blender and food processor and both work well. I’m intrigued by using the wire whisk in the kitchen aid! That’s a new one for me. One caution about the wire whisk is the chance to bend or break a wire. Most machine whisks are designed to aerate fairly liquid mixtures. We had to replace several at the culinary school! My food processor is small too, I’m planning to make the dough in two batches and then knead them together. You know, it’s funny- I have all those kitchen machines, but lately I am really enjoying doing crusts by hand. I think you can really get a sense of how it’s coming together. I think I’m going to try it with the stand mixer, at least for the part where the fat is cut into the flour. Then add the wet ingredients by hand since there’s more control that way. Hadn’t thought of trying the whisk attachment, whenever I cut fat into flour using the mixer I always use the flat one. I don’t have a food processor or stand mixer, so pastry blender it is for me! I am also planning to try making this over the weekend! Me too! I just picked up a pastry blender today at the store, so we’ll see how this works out! i m thinking of making a vegetarian version !!!! I’m not a big fan of prosciutto myself and thinking of adding roasted red peppers and spinach. There’s a Cooking Light version that uses roasted red peppers, mushrooms and spinach. I think I’m going to try that in the filling. Amy, I’m baking before Passover and just holding my post. It’ll be my last blast of chametz! Saira, I just called my husband to tell him I get to host, he said it sounded good, he loves pizza, loaded with meat…me on the other hand, not so much, going for a veggie pizza. Can’t wait to see what you make. Have fun, and we’ll see ya on Tuesday Apr 3rd!! I love Veggie pizza … There is a veggie version of Pizza rustica in this months issue of cooking light …. will see what veggies I have on hand that do .. very excited to try it out .. as I have no idea at this point what filling i am going to make … !!! :-) though I love peppers and spinach !!!! Great !!!! will be looking forward to see you pizza too !!! I’m also going to do a veg version. I think I’ll saute sliced mushrooms with some fresh thyme and maybe some shallots. I’m doing vegetarian version for sure! I was thinking sundried tomatoes, artichoke hearts, and spinach. I am too! Was thinking of kalamata olives to replace the saltiness of the olives. that’s what I did — kalamata olives, spinach and a layer of tomatoes. Workd out pretty well. I just pulled my pizza rustica out of the oven! One thing is slightly concerning to me; there seems to be a lot of juice on the top between the lattice. I assume it’s probably because I took some (okay, a lot) of liberties with the recipe. I used low fat ricotta and added roasted pepper and spinach instead of prosciutto. I hope it stands up okay to slicing! How did it turn out? Did you use raw spinach or did you saute it first? I could see the water in the spinach making the filling runny. I was going to blanch the spinach and then squeeze out as much water as possible. Did you do this as well? i will probaably put either spinach or chard into my filling, too…i’ll defintitely squeeze out the extra water. and i plan to strain my ricotta, too, since it often has extra liquid in it (we do this for everything we use ricotta for in the restaurant i work in). i’ll put it in a sieve lined with cheesecloth or a paper coffee filter and let it drip for a few hours or overnight before i mix the filling. Good idea about the ricotta! Yes, draining the spinach & ricotta would be a good idea. It doesn’t take much extra liquid to get the recipe too moist; unless you can cook it a bit extra without any detriment. I’m planning to make a vegetarian version and was thinking of using spinach. Reading the comments about moisture – I’ve noticed that frozen kale is available and much drier than frozen spinach, so maybe I’ll try a version with kale. Make sure that whatever you add is as DRY as possible. Cook/squeeze as much liquid out of ingredients as you can. I made this over the weekend and the jury is still out. Stuck to the basic recipe. Used homemade ricotta made from goat milk. Had to use my 8″ tart pan because I don’t have a 9″ pie plate. There was some leftover dough and filling. I made a small calzone with the leftover dough, but still have some filling. I’m just not sure if I liked the sweet dough. There was not enough taste contrast like in a salted caramel, etc. The pie was essentially a baking success, but I think it could have used some add-ins, so I will make again and add some things to the filling. I agree, it was soo sweet! The dough would probably be better with a lot less sugar, at least half the amount, maybe less. Or at least something in the filling that would really cut into that sweetness. I have to thank everyone who has posted comments and questions already. You’ve addressed some questions that I had about this recipe. I think I’ll be making this to take to an event next Saturday afternoon for which I need to provide lunch for a small group. Here’s one small auxiliary question: Would this be good served with a side or garnish of tomato sauce (marinara-type sauce)? I don’t think it needs tomato sauce. It would probably overwhelm the filling. I think the salty filling, sweet crust dynamic is really good. I served ours with steamed asparagus. I ended up serving it with no side anything, and it got raves. I was a little skeptical about it before I got going, but have to say that I was happy to be proved wrong. Any idea what to use in place of ricotta? My husband hates anything curdy so I need a sub. Karen, the filling is pretty smooth – no curds like cottage cheese. If you use half ricotta and half sour cream it makes for a smoother filling. I made it this weekend. I thought it was tasty. I think if you think of it as more like an italian quiche than a pizza you will like it better. I made it with sundried tomatoes and artichoke hearts instead of the prosciutto. Wendy, yours sounds really good. I love sundried tomatoes and artichoke hearts. I’m looking for a vegetarian alternative to the recipe and while a lot of the other suggestions sound good, yours sounds really good, especially considering the sweetness of the dough. I agree with Wendy that it’s more like a quiche than a pizza. I subbed green and kalamata olives for the proscuitto. It was tasty, but if I made it again, I’d leave the sugar out of the crust – I just couldn’t get past the sweet crust and savory filling. I noticed kind of late that it’s supposed to cool completely before serving. I cooled it for about 20 minutes and served it warm, which I thought was good. I’ll be making mine tomorrow. Been putting off making this when I realized it was not an actual pizza. It sounded a bit bland to me so I will be adding roasted red peppers and spinach. Hope it turns out tasty. Looking forward to seeing all the results on Tuesday! I try not to cook prosciutto since it´s a cured ham, not baked. But maybe I´ll try it. It´s that or bacon. For vegetarians, what works wonders in fillings together with ricotta is roasted diced zucchini and/or butternut squash. I use it all the time to fill savory crepes. Zucchini and butternut squash sound great. I definitely want to make a veg version. Made the Pizza Rustica and my family loved it. I used Prosciutto which lended a mild ham taste. Loved the taste of the sweet dough against the salty prosciutto. I did add a few spices…garlic, pepper and oregano. I will be making it for Easter…it’s worth the time. I made mine at the weekend and it’s definitely more of a quiche than a pizza. My daughter loved it, I wasn’t as keen, prefer my usual quiche recipe. I’m in the process of making this now. It says to cool completely. Is this meant to be served at room temp? Has anyone tried it warm or cold? I ate my first piece when it was too hot. Wait until it cools to room temp. I made it on Monday. We ate it at room temperature. It was tasty. I heated it up in the toaster oven at work today. The top crust browns really fast. I should’ve put some foil over it. I liked it warm better. I agree warm was better than room temperature. I liked this better than I thought I would. This was way easier to make than I was expecting, except rolling out the dough – I can’t believe the book doesn’t say to chill it first! Am I the only one that was underwhelmed with this recipe? It was an easy recipe! I had issues with the dough. I was thinking it should have been chilled or worked more. Glad it was an easy one though. The lemon loaf will be an easy one too. We had this last night for dinner and really liked it! I used bacon because the prosciutto I can buy here is not that great & very expensive and I used little fresh mozzarella balls instead of the shredded. My husband really loved the sweet/savory mix. I would definitely make this again! I think bacon sounds great! Maybe with leeks and gruyere cheese? My husband and I really liked it too. The sweet/savory contrast was a nice change. Made this last night. Turned out beautiful. The pics… we’ll see. Next time I need to remember to add some salt since I omitted the prosciutto. I made this Monday night & have been eating it for lunch the past couple of days – it has held up really well. Everyone in my house is calling it a ricotta pie – and I kindof agree…. We found it kept very nicely for several days in the frig! And it was quite tasty. Now I’m nervous about it! I was hoping to like it, but I don’t like quiches, or anything similar (usually)…I guess we’ll see how it goes tomorrow! You may be surprised. This is not “eggy” like a quiche. Lighter in texture. what about adding chopped roasted green chilies?? would this work or is it totally out there? My opinion is that this type of recipe lends itself readily to many substitutions in the vegetable area. The roasted chills sound very good to me. Last month I bought myself a food processor and I was sooo glad I did it! The crust is now resting in the fridge. I’m preparing the filling and to the original recipe I’ll add some carrots, spinach and onions to it (this veg will be cooked first in a bit of oil) and some italian spices. Sooo looking forward to our dinner tonight. PS: I’ve used 1 cup wholemeat flour and 1 cup all purpose flour. Yeah, for your worthy purchase of a new food processor! They make many kitchen tasks so quick & simple & there are amazing models out there now to choose from. Cook on & enjoy! Congratulations! I think you are really going to enjoy it. Can you freeze leftover pizza rustica? I routinely will do a “freeze test” of new items, just to answer for myself this very question. Set my microwave for reheating one slice of pizza and watched it like a hawk, since the two differ in density considerably, pulled it when I felt is was sufficiently heated through. Texture of filling was good- almost as good as when first served, Crust, likewise. Not sure how a whole one would freeze/reheat, but these were my findings. My food processor is fairly small (7 cups? Maybe only 5?) but I love it. I have Julie Child’s cookbook The Way to Cook, and in it she raves about the convenience of the food processor – she says even if you have to do two batches to mix and then combine on a final mix or knead, it’s worth it. Have to say I agree wholeheartedly. I made the rugelach dough in it as well as the dough for the pizza rustica, and they turned out wonderful. You just need to go light on the pulses, so you don’t overwork it. So very many uses for the food processor (I bought mine specifically to mix cookie dough!). Haven’t made mine yet but found this video with Julia. This should be helpful to me! Thank you for the great link! I loved watching it. I just made my pizza rustica. I used low fat ricotta cheese and sliced up canadian bacon. It looks and tastes wonderful! I didn’t have any issues other then I added 2 tbsp. of water to my dough(it was a little dry). Made it for Friday supper- pizza it’s NOT but it is a very savory, nice pizza like pie. I added spinach & roasted red peppers, yummmm. 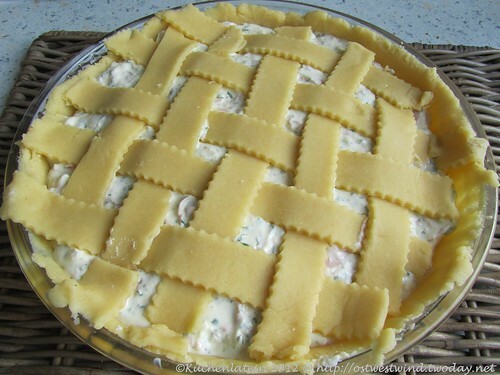 For those who have made this…do you think the bottom crust bakes well, or is it kind of doughy? We make a PR where I work and always blind bake the bottom crust before adding filling and lattice. I just noticed that is not the case with this recipe, so just wondered how it comes out. I was thinking it was strange not to prebake it. Mine turned out flaky. I did cook it an extra 10 minutes though. It´s a common way of using the pasta frolla, which is the italian dough recipe used here. It´s used to make many sweet pies also, like ricotta pie or quince jam pie, and it never calls for blind baking first. Don´t know why. Is this the same as an Easter pie? Keep hearing people talk about Easter pies this week. As you know, this recipe is by Nick Malgieri. He also has an Easter pie recipe, which he just posted on his blog (www.nickmalgieri.com). It’s a lot like this recipe, but it’s sweet, not savory. I’ve made both, and they are quite similar. I made this for yesterday’s dinner! I only have an itty bitty food processor, so I cut in the butter by hand. I also ran out of AP flour, so I used 1/2 cup whole wheat flour and the rest AP. I loved the texture of the crust! It baked fine on the bottom and was flaky, though I had to bake longer than the recommended time. I used my stoneware pie pan, so I’m sure that’s why. I followed the filling recipe according to the recipe, and while it was good, next time I make it I’ll add some different veggies, and definitely some garlic. We just finished off our pizza. I also made it with spinach, but add some corn also. It is a really nice recipe and easy to make. The dough was a bit sticky, but after the rugelach I was prepared. :))) Footnote: For us it looked like a French quiche rather than a pizza. I just pulled mine out of the oven. It smells delicious and can’t wait until it cools. Because we are vegetarians, I made mine with a hot green chili pepper and dried tomatoes, with the parsley. It looks a bit like the holidays! Would have used kalamata olives but my husband picks them out! (What does he know???) Still, I don’t think I could watch him pick through my latest achievement. Already reading through lemon loaf! I made the lemon loaf to go with the pizza rustica tonight for dinner. Both were absolutely delicious! This was great! I used just 3 tbsp sugar in the dough and liked that amount of sweetness. loved it… sun-dried tomatoes, spinach, roasted red peppers. Followed recipe concerning crust except I always use some whole grain when I can. I really liked the sweetness of the crust against the savory inside. I think I would make this again… and I think the green chilies would have been wonderful in it. Next time!! Well, we had our Pizza Rustica. It was very, very good. I could have used a bit more green chili peppers, I was conservative here. But my husband loved it – even if he ‘never had anything like this before and doesn’t know what to compare it to. .. ‘ Ah, men!. I followed the recipe as written, except that I substituted sweet Lebanon bologna for the prosciutto, since I don’t eat pork. It was really delicious warm, and I thought the sweetness of the crust was perfect with the salty-sweetness of the Lebanon bologna. Mmm. I love Lebanon bologna. We love Lebanon bologna also- buy it often & I could agree that it would make a very lovely substitute for the prosciutto. Also, added bonus- did you know that it is lower in fat? I made the Pizza Rustica for dinner tonight. One of my pet bunnies died unexpectedly yesterday and I’ve been really upset about it, but making this recipe helped distract me. My crust needed a couple teaspoons of water to bring it together (and could have used a tiny bit more), and I used shaved ham from the deli because prosciutto is SO pricy, and I used parmesan because I can’t stand romano. So only a couple of little changes. It turned out really well though! Very easy to cut and remove pretty slices from the pie pan, sturdy and golden bottom crust, great flavor all around. I liked the juxtaposition of the savory filling and sweet crust. Never would have guessed the filling ingredients. I was quite impressed with this recipe! Oh, I am very sorry- the loss of an adored pet is always hard to get over. We had rabbits when I was young & I loved them. Good idea to keep yourself busy & occupied & the marvelous thing about cooking is others get to enjoy it also! It is hard, Bev :( The baking was a good distraction. Nice that it turned out well, too! Did yours turn out well?